By the early hours of October 2, polling stations had closed and the Georgian parliamentary elections appeared to have passed without any major violations. Official ballot counts were nearly complete when one of our observers reported that armed special forces had stormed several polling stations in the west of the country, demanded that observers leave and forced officials to change the protocol results in favour of the ruling party. TI Georgia was the first to report the violation and challenge the result. Georgia has no record of a peaceful transition to power. Many feared a confrontation between government forces and the tens of thousands of opposition voters gathered in the streets waiting for the official results. 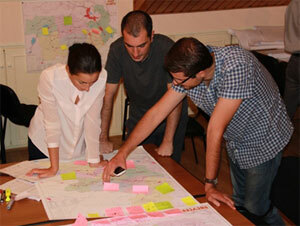 Transparency International Georgia staff members planning the election observation mission. The presence of impartial observers was crucial. 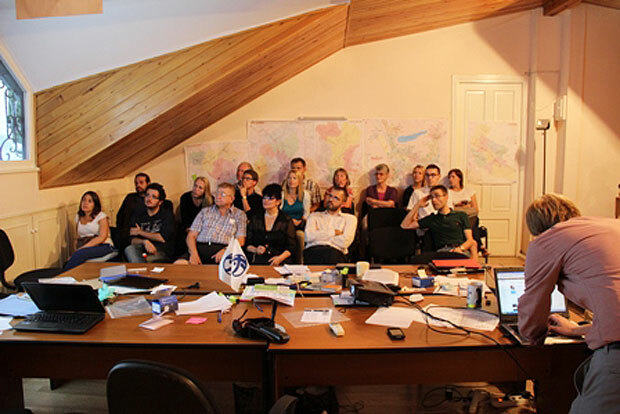 In the first election-monitoring mission of this scale by TI Georgia we deployed 36 mobile teams, 420 domestic volunteers and 56 international observers to 300 polling stations. Assistance came from TI observers from Latvia, Estonia, Lithuania and Portugal. The success of the election-monitoring mission relied substantially on our ability to mobilize TI chapters from around the world and the opportunity to rely on their experience. TI observers from neighbouring countries Armenia and Azerbaijan were of vital assistance at polling stations in minority areas where locals speak little English, Georgian or Russian. In the midst of a tense scene unfolding during the ballot count at a remote, mountain polling station, one of our observers was instructed by officials to recount the votes and told, “you’re an international, you’re unbiased”. Armed with complaint forms and mobile cameras, Transparency International observers were able to identify those polling stations that lacked sufficient ballot papers for the number of registered voters, incidences of voter intimidation and a fake protocol from precincts in the east of the country that had been posted by the Central Election Committee. In order to provide an immediate and reliable news source during the election week, we live tweeted and blogged our observers’ reports of violations. Our work and news conferences received exhaustive global media coverage. Overall, as a direct result of TI Georgia’s actions, the results from 15 precincts were annulled and 11 elections were repeated. The pre-election period was bitterly fought, with both parties expecting victory. The Georgian Dream opposition coalition announced that should they lose the elections they would declare they were rigged and begin protest actions. On the eve of the election, as the protocol figures were collected by TI Georgia the results were dramatic: the opposition coalition had won the vote by 55.1 per cent to 40.1 per cent. The days that followed were tense, while it became clear to voters across the country that the opposition had won. Many feared a confrontation between government forces and the tens of thousands of opposition voters gathered in the streets waiting for the official results. In 2013 constitutional changes will come into effect, and Georgia will become a parliamentary republic; many executive powers will be transferred to the prime minister, Bidzina Ivanishvili. Georgia’s political culture has hitherto been geared towards obliterating one’s opponent. Now many months of compromise lay before the two men, along with the opportunity to build upon a peaceful election and a historic transfer of power. Mathias Huter, Senior Analyst at Transparency International Georgia, briefing the observers from TI Lithuania, Latvia, Estonia and Portugal after elections before their departure. ← Open Government Partnership: From Commitment to Action…?